An old childhood wound between mother and daughter is healed from beyond the grave. I looked up today and it hit me: it’s been one whole year since I last spoke to Mom. Now you might be thinking, “Wow. A whole year, CJ? That’s a long time not to talk.” And you’d be right. Except Mom’s been dead for more than forty. She closed her eyes. Suddenly, I saw a prism of light, gold and silver shooting out from the right side of her head, just above her shoulder. And then Nat’s voice changed. It became fainter, older, sadder. A deep, haunting sigh emerged from her mouth. She dropped her head, her long brown hair hiding her face. Then she released an exquisite, painful sighhhhhh. I shivered. I was fifteen when my mother died. My home life was physically and emotionally brutal. You could say the odds of me surviving were grim. I’ve spent hours upon hours with healers and books and psychics to try and seal up that psychic wound. I told myself that I’d forgiven her. Because: a) I felt it was the right and noble thing to do; and b) I wanted to impress anyone who was telling me to let it go and forgive her. I wanted to be evolved. And free. Free of the physical and emotional pain caused by the abuse. But the next words out of me came from an honest place. She expelled another sigh. Pain swept across Nat’s thirty-something face — a face that didn’t look like it belonged to her. Her head was still hanging. “I didn’t know how to love . . .” She seemed to be searching for the right words. I filled in the empty space. “I know.” What do I say next? I wondered. Oh yes, there it is . . . “Did you ever love me?” Another deep sigh from her, this one more raw. In an instant, my mind scanned the pages of her life, of the little that I knew: the beatings she got from her alcoholic father (I only discovered this twenty years after her death); her teen pregnancy; the grueling factory jobs, and the decimating cancer and mustard-gas treatments. “Really?” she asked, hopeful but unsure. “Really,” I said. And I meant it. “I’m sorry you had to leave the planet early to save me, Mommy,” I cried softly. Nat opened her sweet, smiling eyes. My mother was gone. And I thought to myself, And so it is. You might think this is where the story, a true story, ended. But there was more. Next week, I’d love to tell you the rest . . . Previous Post: Are You Really Living Life? I featured you in my Amazing Stories month over at triggering memories Facebook Page. Have a look…you’re in very good company. We met a Open Books with Linda Sivertsen, did I mention that is who I am? Stupendous. And moving. Keep writing! Wow. looking forward to the rest of the story! Talk about getting intimate with one’s demons. You really have gone where so many of us can’t even imagine going. I have conversations with my mother, as well, and your writing made me return to those frightening years when I lay awake, knowing I was the only one awake in the house… except her. And I would tell myself I must not sleep, because if she set the house on fire, I needed to save the rest of the family. Some nights, I didn’t sleep at all. That she loved me, I have no doubt at all. But her love for me and I for her held a kind of insanity that I felt reading your words. It was from her that I learned as a child to accept unacceptable conduct, which I continued to do most of my life. Thanks for getting so up close and personal. You coax the rest of us to be braver. So wonderfully done, CJ. I’m very happy for you. I sensed something a week ago in your atmosphere. Bless it when truth can enter the scenario of life’s experiences to set one free. May you have continued happiness, peace and prosperity. CJ – this was quite moving. I related to the passage below – that’s how I was trying to “hurry up” my mourning. Thank you. It is a brilliantly written, informative and (a) fascinating read. 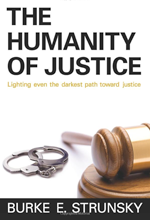 Burke Strunsky’s ongoing faith in humanity and the criminal justice system is refreshing and his unwavering persistence in seeking justice for the victims of violent crimes serves to light a bright path on the very dark road to justice—and offers hope and inspiration to us all.